Align Corrective Chiropractic > Blog > Can Corrective Chiropractic Care Improve Your Health? Most people know to visit a Chiropractor for back pain and neck pain treatment, but did you know that Corrective Chiropractic Care may improve your health? “How does Corrective Chiropractic Care improve your health?” is the response we commonly receive. It actually makes a lot of sense when you understand how the spine and nervous system works. Over the years we have had many, many people report improvements in their health, especially when following a Corrective Chiropractic Care plan. How does Corrective Chiropractic Care improve your health? Very simply, it’s our nervous system that keeps us alive, healthy and functioning the way we should. Any damage or irritation to the nervous system has the potential to impact our health. The shape of our spine plays a vital role in supporting and protecting our nervous system and Chiropractic is the best way to maintain the correct shape, alignment and movement of the spine. It makes sense that a problem with our spine could impact our nervous system which in turn could have a negative impact on our health. This is actually the theory behind Chiropractic’s development in the 1890’s. The goal of Corrective Chiropractic Care is to structurally improve the shape of your spine to an ideal alignment. Ideal alignment results in less strain on your spine and nervous system, and therefore the greatest potential for your nervous system to function optimally. Common signs of improved health. 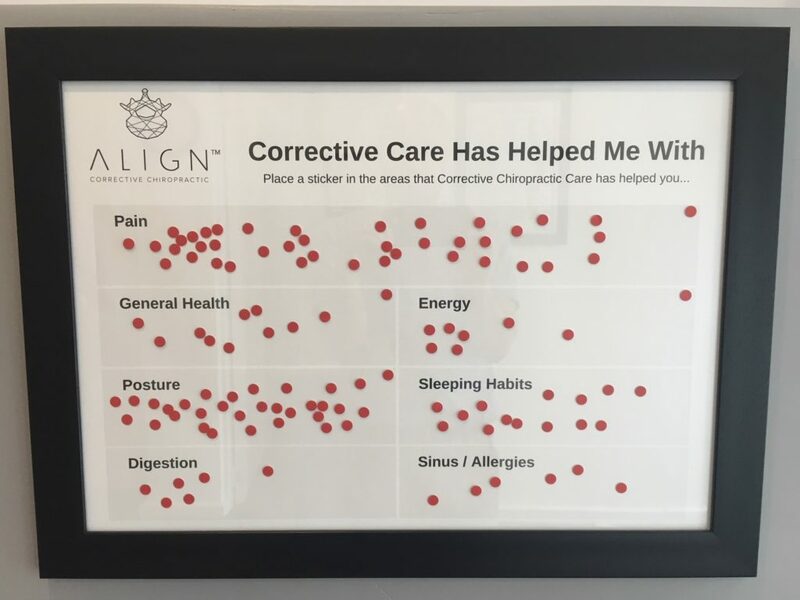 At Align Corrective Chiropractic we frequently have patients tell us that as their posture improves, so does their sleeping habits and energy levels. Improvements with sinus problems, digestive issues and headaches are also frequently reported. Patients will often say that their general mood improves, and they feel more positive and in control of their health when following a Corrective Care plan. Chiropractic is so much more than just a treatment for lower back pain, it gives hope. Over the past couple of weeks we have been running an experiment in our office. We invited our regular patients to place stickers on the areas in which they have noticed health improvements since following a Corrective Care plan. The results are quite clear. Corrective Chiropractic Care is helping our patients with far more than just Chiropractic treatment for neck or lower back pain. Will Corrective Chiropractic Care improve your health? Every person is unique and therefore responds uniquely to Chiropractic Care. Some health improvements may be very obvious whereas others may be more subtle. Just imagine if something as basic as taking better care of your spine was the answer to your health problems. We believe that a healthy well aligned spine is essential to good health. Our goal is to help every patient, regardless of their symptoms, maintain a healthy spine. We use the most up-to-date, researched Corrective technique to assess and correct each person’s spine to a more ideal shape; improving alignment, movement, flexibility and posture.